Hello – hello everyone and thanks so much for stopping by to help celebrate the launch of yet another fabulous kit by Hero Arts – July 2018 My Monthly Hero Kit (more about the kit, blog hop and giveaway below). I have 2 cards to share featuring the kit and some of the add ons. If there’s time later in the month I’m hoping to make a few more cards and possibly do a video featuring the add ons. 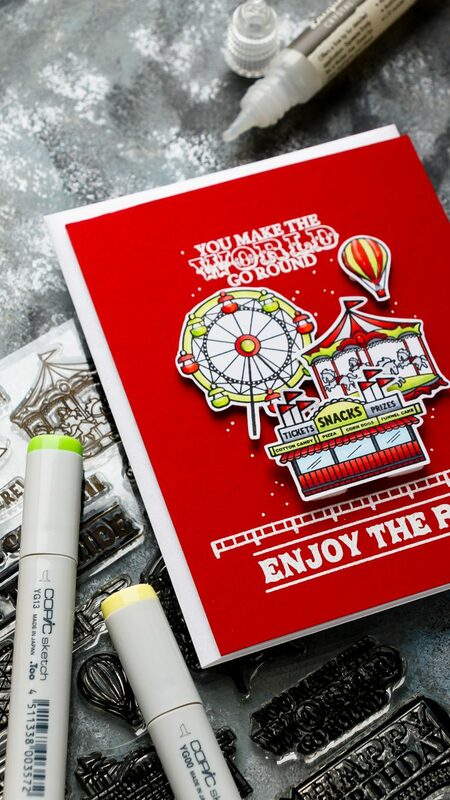 I started making this card by stamping images in Copic marker friendly ink onto white paper. These images are very small and there’s not much room for coloring or blending. To me – these are the best types of images. There’s just something about these tiny prints that makes me want to use them over and over again. Hero Arts last year October or November kit had similar style images, those were for the Santa’s village and I just loved them! They are so perfect for making little cards with scenes. Next, I used my Copic markers and colored. I used my go-to Copic marker colors and went with red, green, blue and a hint of gray color combo. 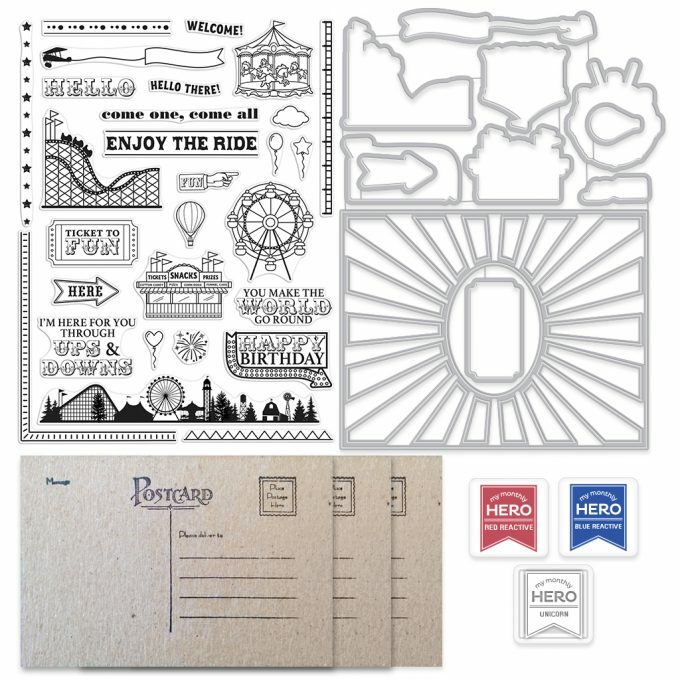 There are coordinating dies for these images in July kit so you’ll be able to cut all of these out in your die cutting machine. I only had the stamps to play with this month so I actually cut these out using my Tonic Studios scissors. Next, I white heat embossed sentiments onto red cardstock panel and foam mounted images in place. 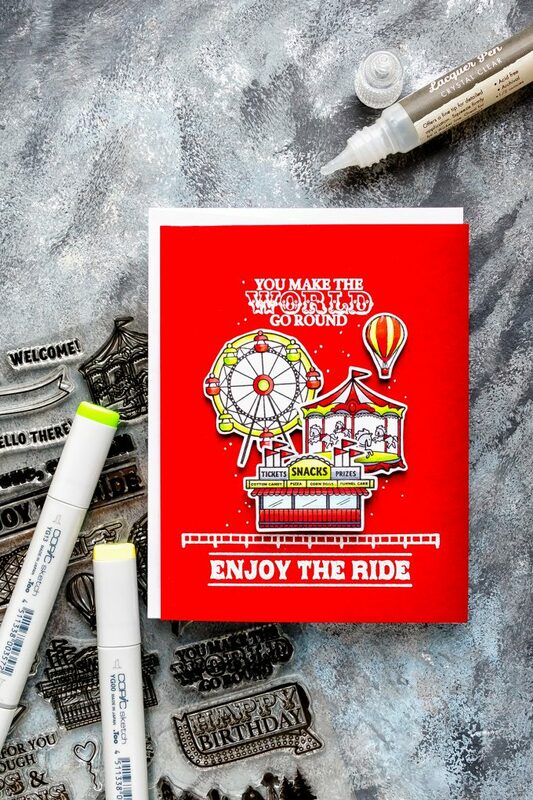 I love how my friend May Park always adds a ton of gorgeous detail to her clean and simple cards using a white or a black pen and I wanted to add some to my card as well. I also used Hero’s Lacquer pen and coated some of the images to make them dimensional. The kit is available for a limited time only – once it’s gone, it’s gone. If you love it – grab it now! I also made a similar card, a Birthday card, but this time I incorporated a few add ons from this month. 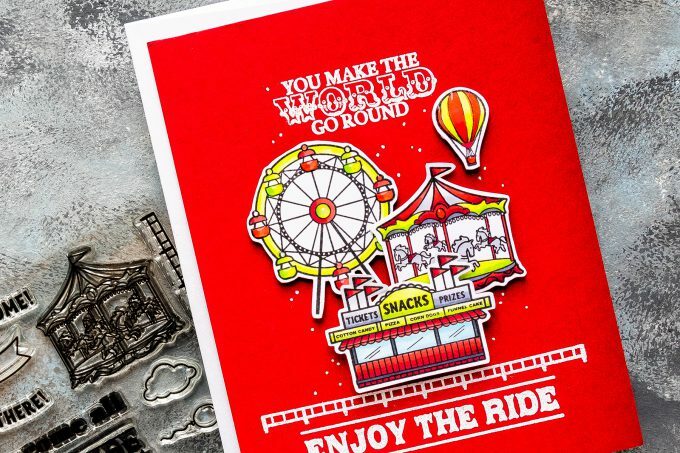 I used Country Fair bold prints background and stamped it in Versamark ink for a tone on tone look for the background of my card. 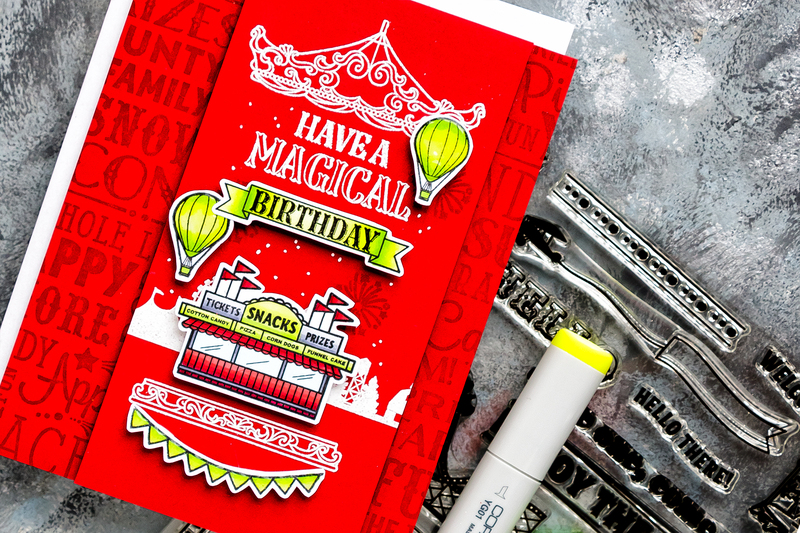 I also white heat embossed a few images from the Ornate Carousel stamp set to create a base and top for my scene and I also used a sentiment from this stamp set to have my card say “Have a Magical Birthday”. I’m the last stop on this hop, you can start over at Hero Arts blog. Hero Arts is giving away one kit as a prize to one blog reader – selected from the comments across all of the blogs in the hop so be sure to leave a comment for your chance to win!The giveaway closes Sunday, July 8th at 11:59pm, and the winner will be announced the following week on the Hero Arts blog. Red is my favorite color and this set looks GREAT on the red cardstock. Thanks for all the great examples. I love the colors you chose for these cards. To me, they are true carnival colors! Love this kit! Fantastic cards! 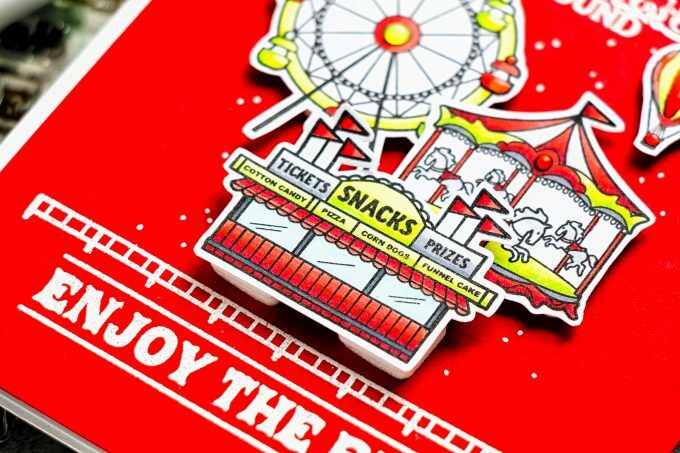 Use of the red background with white embossing was brilliant and so different from what the other designers have done with this set. Absolutely love these fun cards. Thanks for inspiring me! Love the color combo – not something I would have tried but it really works! The pop of ‘Birthday’ on the banner of the second card is perfect. Thanks for sharing. 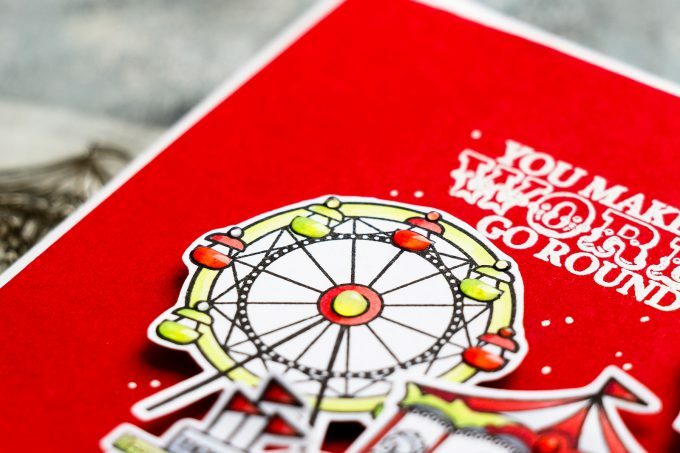 Yada, your card is so bright and fun! I love all the happy red! beautiful designs and amazing look! LOVE the red! So pretty and fun! Love your beautiful coloring of this carnival and I adore the red background–I usually avoid red backgrounds for most things, but it’s perfect for this project. Amazing card. Love the red color. Amazing love all the details. 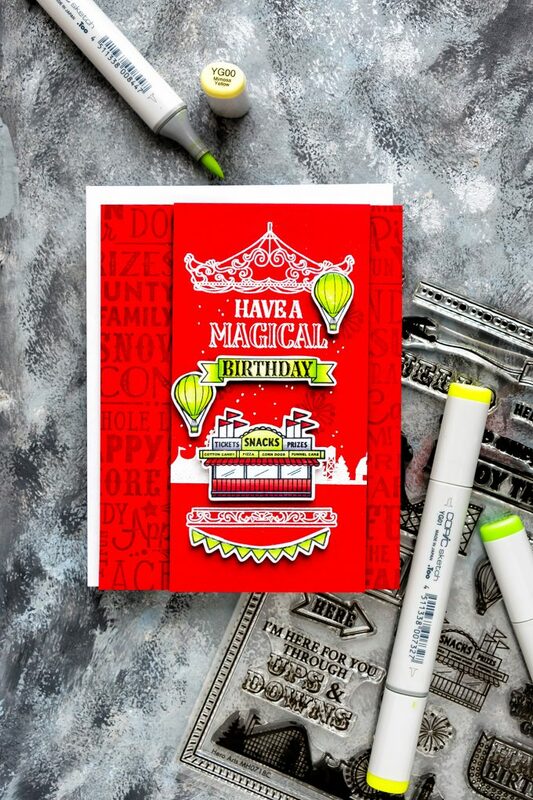 Love this bold red card, so fun! The extra details really add a lot. TFS. Lovely cards the red really makes them pop!! Another amazing release. Great patterns, coloring, and designs. Just amazing! I just love it, so fun. Great cards! 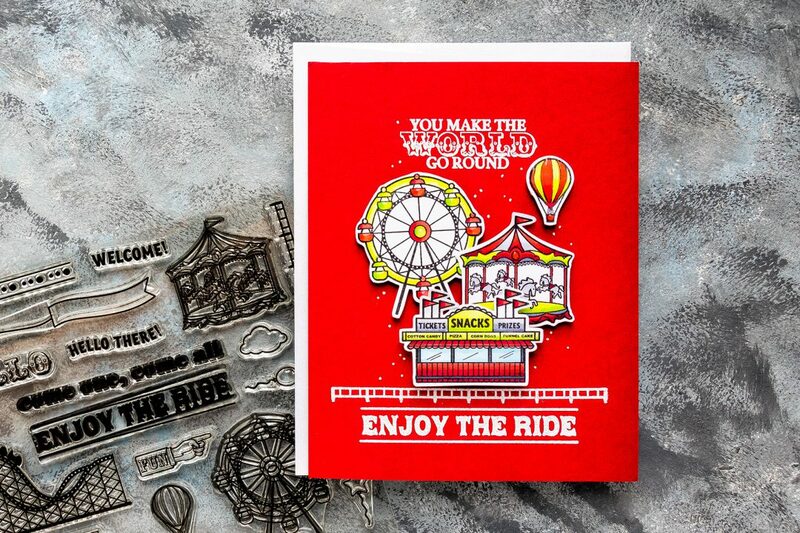 Love the white heat embossing on red. Also really love the background stamp in card 2. I am in love with your red cards using this months stamps! Perfect! Nicely done! Such interesting colors and card designs. This is a great set.